Dearest hubby has a soccer friendly yesterday hence couldnt fetch me from work. Before I head home, I went to Cold Storage at Funan to buy my angel's diapers. Typical as I was, I visited the baking section and bought myself a square baking tin. While browsing the food stuff, I decided to bake a cake for hubby. It has got to be strawberry coz that is his fave. 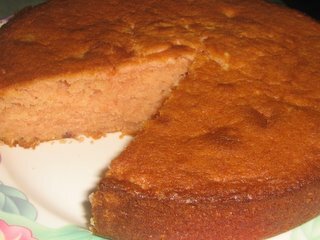 I havent got any strawberry cake recipe and has to make do with whatever recipe I have and then tweak it a little. I couldnt decide whether I want to use fresh strawberries or strawberry yogurt. I settled for the latter and then baked my version of a Strawberry Yogurt Cake when I got home. Mix in the strawberry paste. Fold in the strawberry yogurt. Finally fold in the rest of the flour. Turn the mixture into the greased tin and bake for about 40 mins. Allow cake to cool in turn for about 10 mins before turning in out to cool on a wire tray.